When is it okay to have a coup in a democracy? Given the number of Mali experts that came out of the woodwork following the coup and French intervention, I am a little surprised by the lack of debate in the Africanist blogosphere about the wisdom of holding presidential elections this July. In the middle of a US-funded military training seminar, a Malian military ofﬁcer asked: ‘When is it okay to have a coup in a democracy?’ A Malian who assisted in the seminar shared the quote with me as evidence of how far the country still needs to go in terms of democracy. The statement is not surprising given Malian history, where coups d’état have been a method of regime change. It also sheds light on the March 2012 coup – which many Malians who are deeply committed to democracy saw as an essential ﬁrst step to ending widespread corruption within the state as well as halting state involvement in illicit criminal activities. Ironically, for many Malians the only way to get democracy back on track was a coup d’état, and the current rush towards elections is viewed with suspicion and the fear that hurried elections will only bring Mali right back to the pre-coup status quo. ….There is little question that the current regime lacks legitimacy and perhaps an elected government will enjoy greater popular support. But there is a risk that a rapid transition back to multi-party politics will only serve to reinforce the political challenges that faced the political class prior to the coup d’état. whereas the vast majority of successful coups before 1991 installed durable rules, the majority of coups after that have been followed by competitive elections. We argue that after the Cold War international pressure inﬂuenced the consequences of coups. In the post-Cold War era those countries that are most dependent on Western aid have been the ﬁrst to embrace competitive elections after the coup. Our theory also sheds light on the pronounced decline in the number of coups since 1991. While the coup d’état has been and still is the single most important factor leading to the downfall of democratic government, our ﬁndings indicate that the new generation of coups has been far less harmful for democracy than their historical predecessors. For his troubles with the Wade government Youssou Ndour gets appointed to the new Cabinet of President Sall. The unintended consequences of the Malian coup continue to mushroom. AQIM seems to be taking advantage of the power vacuum left in the north of the country. Lots of people scared out of their wits over the latest developments. Scientists in Kenya are working on a male contraception pill. May be this time the product will be good enough to overcome cultural barriers and the gender politics of contraception? Mutineers in Mali have appeared on national television to announce the overthrow of the “incompetent” government of President Amadou Toumani Toure. More on this here. Also, I must hand it to Jay Ulfelder over at dart-throwing chimp for nailing it on Mali’s coup risk in 2012. What started as a mutiny in Mali on Tuesday night appears to have degenerated into a coup. Mali was due to hold elections on April 29th 2012. 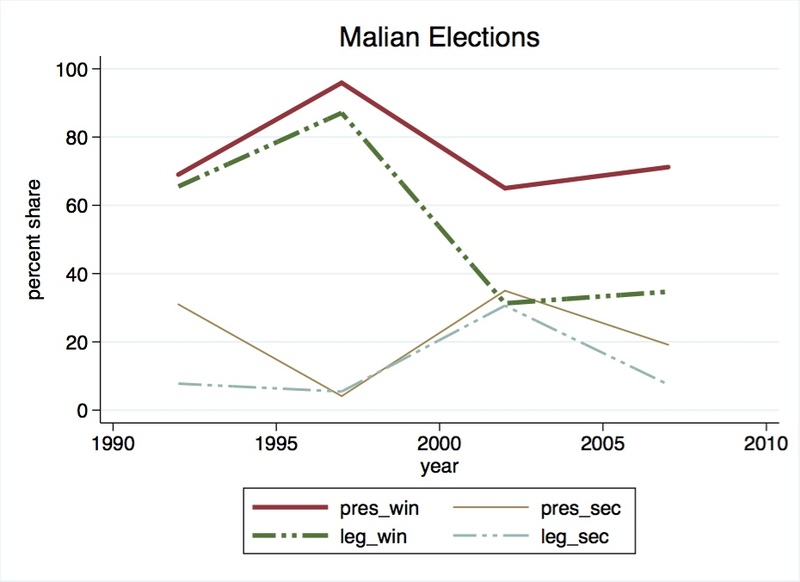 Since (re)democratization in the early 1990s Mali has routinely been cited as a case of democratic consolidation despite seemingly insurmountable odds (poor HDI scores, etc.). The current developments, however, raise serious questions with regard to whether the Malian political and military elite have wholly bought into the idea of settling their battles for power and influence at the ballot. Furthermore, existing evidence (see below, part of an ongoing research project) paint a picture not of consolidation but of a cycling of over-sized coalitions that are prone to executive control and manipulation. The non-existence of stable elite coalitions (as appears to be the case in the stylized comparative case of Ghana) is a recipe for elite political instability as we are currently witnessing. Oversize coalitions in government under electoral democracy are not a sufficient condition for elite political instability, but they are definitely a sign that things might not be right. The idea here is that stable coalitions create room for self-enforcing arrangements among elites by raising actors’ audience costs. A regular cycling of over-size coalitions flies in the face of all of this – resulting in near-permanent first mover advantage and incentives for those left out to use extra-constitutional means to gain power. The proximate cause of the mutiny and eventual (attempted) coup in Mali might have been a confluence of weak state coercive capacity and the resurgence of the Tuareg rebellion in the north of the country (fueled by weapons from Libya); but one cannot rule out the significance of the enabling structural conditions. 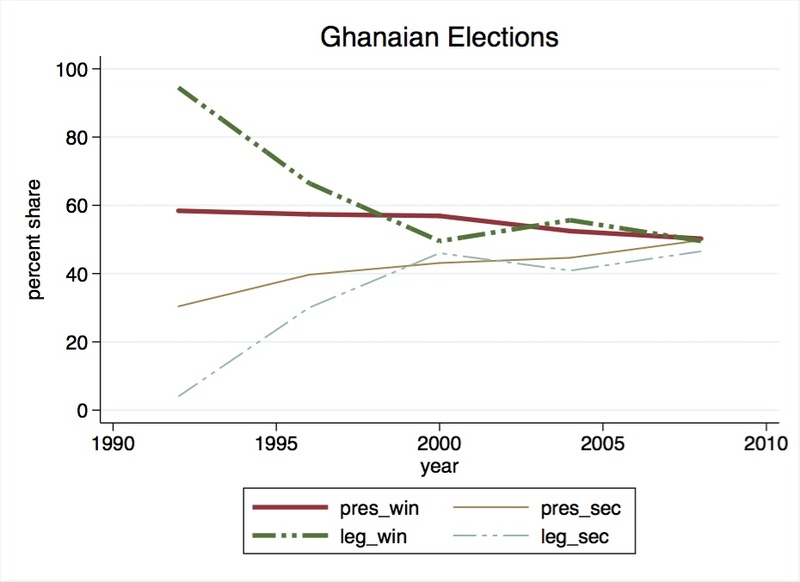 This is a data point on coups in Africa that I rather did not have. African states dominate the Economist’s child-bride index, with the Sahelian states of Mali, Niger and Chad in the top three. They also have the lowest literacy rates among their female populations. This is one of those problems associated with “culture” that most development experts shy away from. My take on this is that the cultural defenses of such practices is a lot of horse manure. There is nothing African about marrying off a 12 year old girl. Most child marriages have deep-rooted economic motivations. In most cases it boils down to the bride-price. Solving the problem will therefore require not just laws that throw “human rights” at young African girls, but a concerted effort that also includes development practitioners to provide alternative income to men who marry off their 12 year-olds in exchange for goats.